I was super excited and very proud to attend the industry’s biggest show of the year, Texprocess. 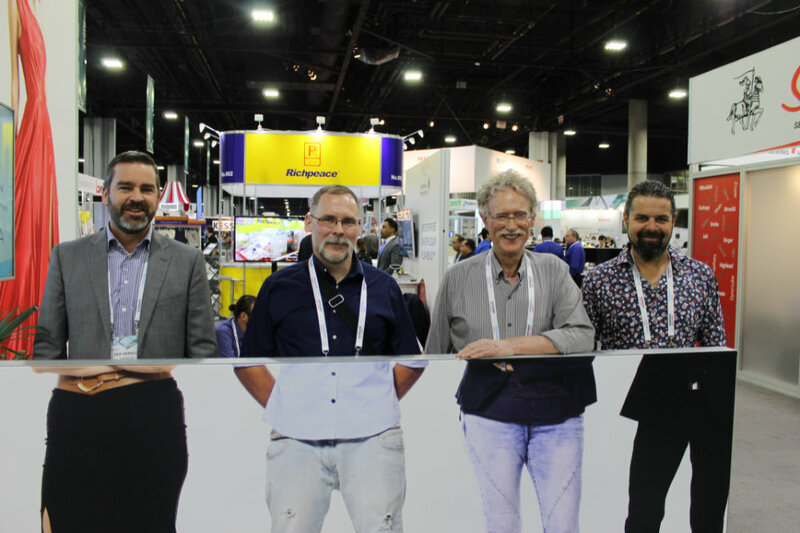 Held in Atlanta’s Georgia World Congress Center from May 22nd-May 24th, the show set records for attendance and industry participation. Texprocess was a high energy show full of incredible business opportunities, groundbreaking technology, and enthusiastic attendees. Shown above is our eye catching booth that set visitor records. 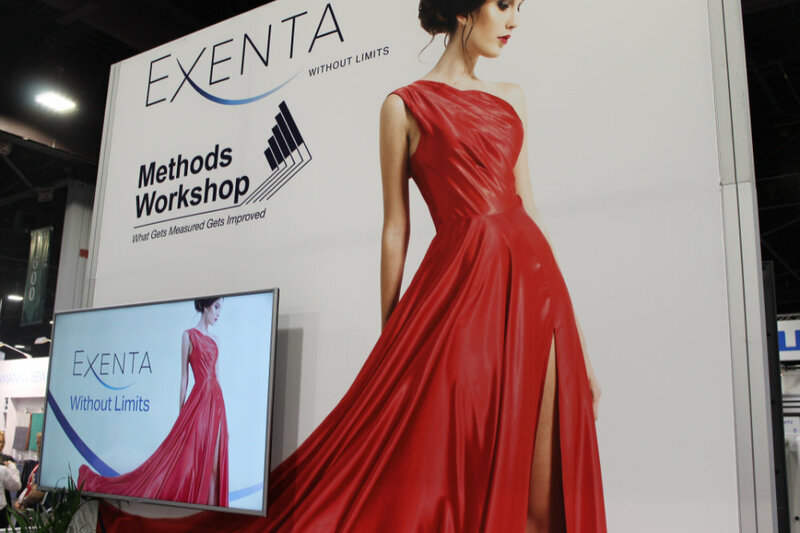 Exenta was in full force with two large booths among hundreds of others in a huge space dedicated to apparel industry software. 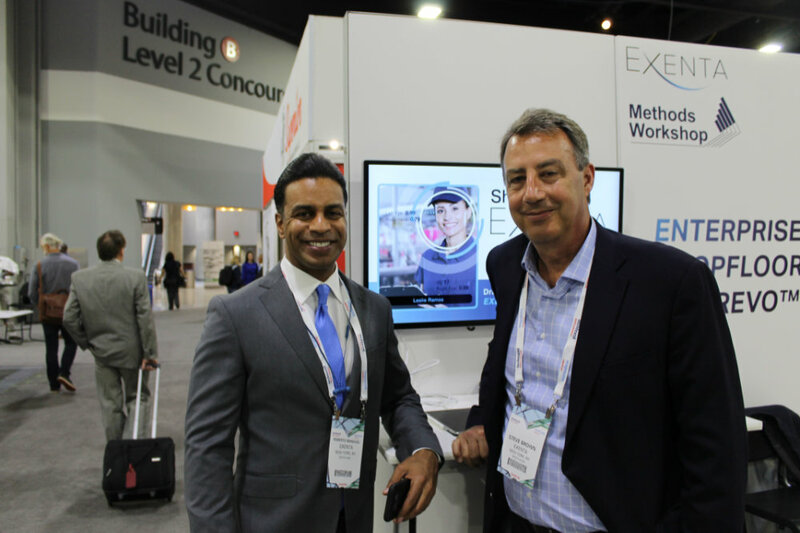 During the show, Exenta’s Shop Floor Control division launched two new initiatives. Especially exciting to me was the growing contingent of attendees from Latin America—fully one-fourth of the total attendants. Exenta’s Shop Floor Control has a growing business in Latin America and we were thrilled to see how much acceptance we have received in this very important market. Jay Wright (right) from Albany Industries receives a demo at our booth. 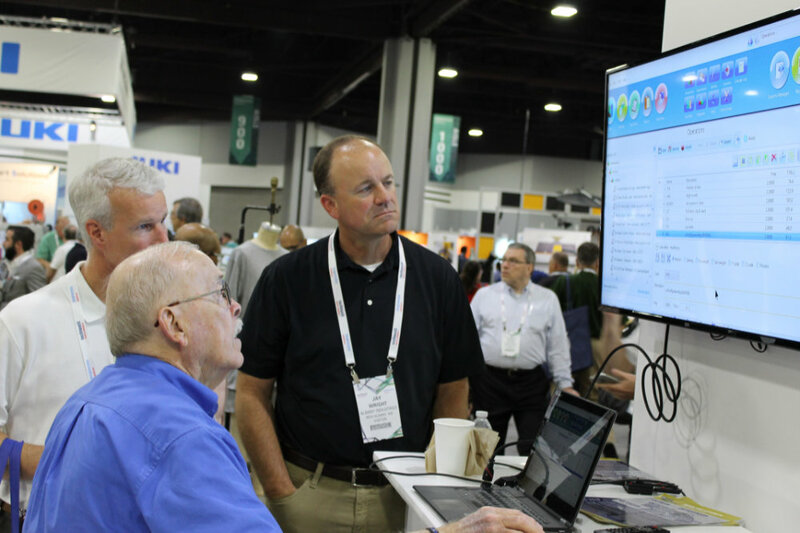 Justin Hershoran (middle) and Steve Brown (right) are shown explaining one of our products to a Texprocess visitor. At one of our booths, we co-located with Methods Workshop, and showcased how our respective software programs can work seamlessly together. Our CEO, Roberto Mangual (left) and Director of Sales, Steve Brown (right) were active participants at the show. While one booth was busy demonstrating Shop Floor Control, our other booth concentrated on Exenta’s other key products like PLM (Product Lifecycle Management) and ERP (Enterprise Resource Planning.) We also focused on new additions, like our PLM REVO solution and new and improved Exenta Enterprise solution. We were thrilled to showcase these products to our quickly expanding customer base, and showcase how they can immensely change any business. 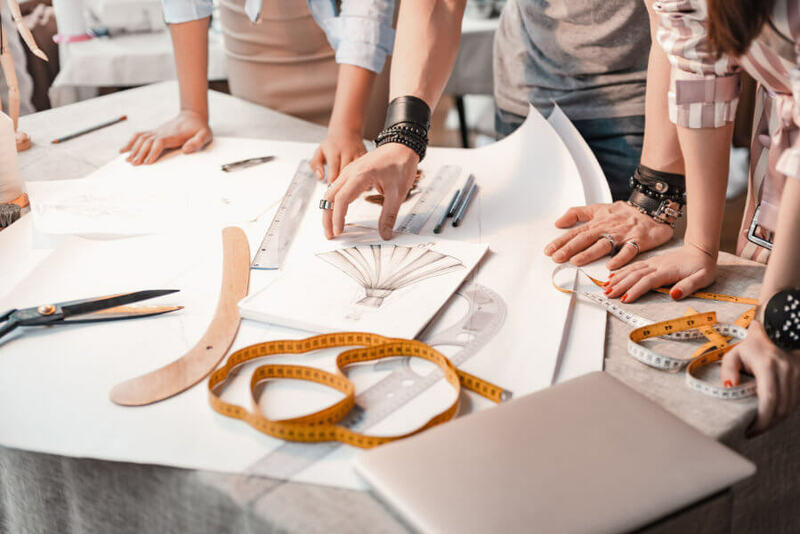 Now that we are no longer just involved in the apparel business, we are proud to work with companies in many industries, such as footwear, jewelry, and handbags. We strongly believe that we have the best product in the business, which was emphasized at the show. We are also proud to be supported by a fantastic sales team. Throughout the day, we participated in lively discussions, made new contacts, and provided demos for prospective clients. It was a fascinating few days full of innovative products and attended by talented and well respected business associates. I can’t wait to see what next year’s show has in store. Our most recent community forum took place on May 7, 2018 and was a huge success. We had a near capacity crowd of 50 people including many of our clients, who came out to join us for an informative and exciting day of presentations covering ERP, PLM Revo and Shopfloor Control. Pictured above is our CEO, Roberto Mangual, who visited virtually every table at our event. 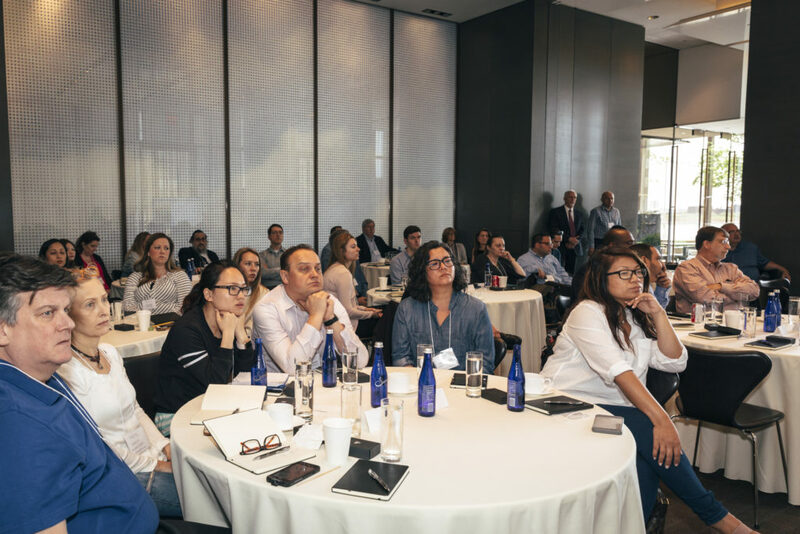 After presenting about each program, we held a Q & A session as well as demonstrations of the systems, to help our clients better understand how our software can help their businesses excel at what they do. From creating less work for designers using our PLM plug in to tracking time and attendance using face recognition with Shopfloor Control, there truly was something for everyone. Our attendees listened attentively to the exciting presentations being given. Pictured above are some of our clients from MindsInSync. 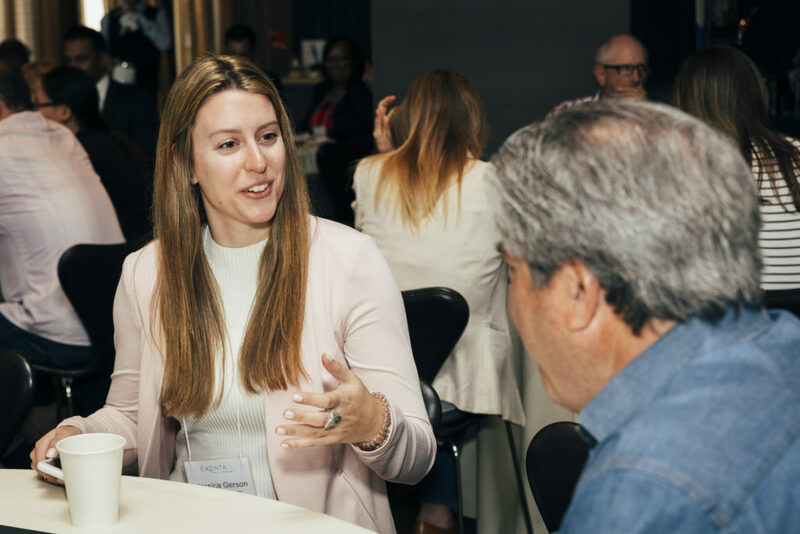 Below that is Jessica Gerson from Gerson and Gerson speaking with Exenta’s Don Middleberg. We’d like to thank all of our clients, friends, and business associates for attending, and we look forward to seeing you all again at our next event.